Although Operation RubyThroat and hummingbird research at Hilton Pond Center for Piedmont Natural History focus primarily on local studies of Ruby-throated Hummingbirds (Archilochus colubris), occasional hummers of other species afford the opportunity for us to join with other banders-- and especially the Hummer/Bird Study Group--in banding and monitoring vagrant hummingbirds in the Carolinas. For example, Rufous Hummingbirds, Selasphorus rufus, which breed in the western U.S., are being seen with increasing regularity in the East--perhaps because more folks are leaving hummingbird feeders up in winter (immature male rufous at right). 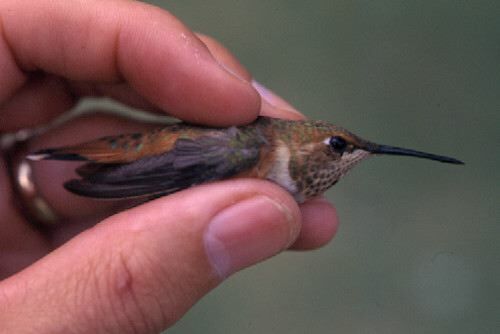 The first adult male Rufous Hummingbird recorded in South Carolina during summer was banded by Hilton Pond Center staff in August 1994 in nearby Sharon SC. In order to get a better understanding of hummingbird behavior in North America, it is important to report all sightings of vagrant and winter hummingbirds so banders can capture and positively identify as many individuals as possible. Especially in the Carolinas, send sightings of non-rubythroats (or ruby-throats in winter) to RESEARCH. Information about vagrant or winter hummingbirds--i.e., any hummingbird seen between 15 October and 15 March in the Eastern U.S. or Canada--will be forwarded to a bander in the nationwide network who is close enough to visit the site for possible capture. 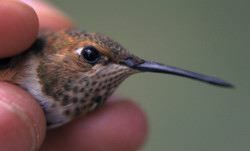 For details about vagrant hummingbirds in the eastern U.S. and our studies of them, visit the Web site for Hilton Pond Center for Piedmont Natural History, specifically Winter Hummingbird Banding. Leaving a sugar water feeder up in autumn will NOT keep Ruby-throated Hummingbirds from migrating. Hummer migration is stimulated by photoperiod, so as days become shorter in fall the birds begin to put on fat and soon depart for the tropics. In the eastern U.S., nearly all hummers that stay behind are those that are ill or "genetically inferior," and it's likely they would die in migration anyway. We suggest you maintain one half-full feeder--changing the artificial nectar weekly--throughout the winter. You may need to bring the feeder in at night to keep it from freezing and put it out the next morning before dawn when you fill your seed feeders. In really cold weather, alternate two feeders by putting the warm one out at mid-day and bringing in the cold one. Some folks even use heat lamps, electric pipe wrap, and other creative contraptions to keep the sugar water warm and snow off the feeder.